Timothy “Blue” Nicolei, 60, of DePue, died at home on March 12, 2019 after heart complications. Cremation rites will be accorded. A Celebration of Life will be 1:00 PM Friday in the Hurst Funeral Home in La Salle. Visitation will be in the funeral home on Friday from 11:00 AM until time of services. Tim was born in Chicago on March 30, 1958 to Joseph and Ellen (Smith) Nicolei. He was an amazing person and tattoo artist, touching people’s lives in counties across Illinois and the surrounding states as well. He was a local legand that most knew—leaving a lasting impression on anyone who met him. 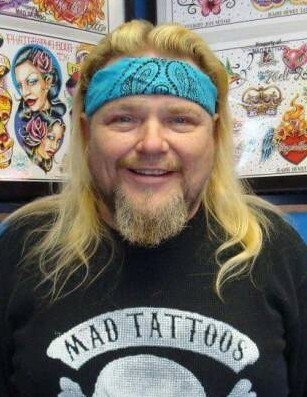 The creator and operator of Blue Sky’s Tattoos of La Salle, IL, one of the first professional tattoo shops in a 50 mile radius in the 1980’s and into the 1990’s, setting the presence of tattooing for the local area. He was also an avid rider and lover of both motorcyles and trikes. Often participating in Toys for Tots and riding with the Brothers of the Third Wheel, he was an incredible man that will be dearly missed. Tim is survived by one daughter Misty Nicolei of Key West, FL; three sons, Josh Nicolei of Hobart, IN, Cody (Brittany) Starker of Princeton and Skyler Nicolei of DePue; three grandchildren; two brothers, Joseph (Brenda) Nicolei of Florida and Danny Nicolei of Alabama and one sister Donna (Stanley) Kutka of Chicago. He was preceded by his parents and his life long partner Vicki Nicolei.